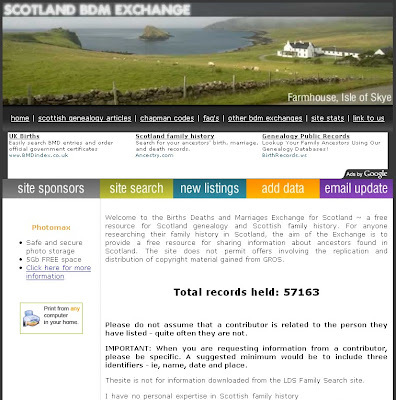 Scottish Birth, Marriage and Death Records are being exchanged for free on the Scotland BDM Exchange website. This website does not contain all of the Birth, Death, and Marriage records as it is designed to be a collection site for those offering to donate their information for others to view. If you happen to find your ancestor posted on this site, you may then contact the person that posted the information via email. "Welcome to the Births Deaths and Marriages Exchange for Scotland ~ a free resource for Scotland genealogy and Scottish family history. For anyone researching their family history in Scotland, the aim of the Exchange is to provide a free resource for sharing information about ancestors found in Scotland. The site does not permit offers involving the replication and distribution of copyright material gained from GROS (General Register Office). Please do not assume that a contributor is related to the person they have listed - quite often they are not. IMPORTANT: When you are requesting information from a contributor, please be specific. A suggested minimum would be to include three identifiers - ie, name, date and place." The search engine of this website works nicely allowing you to search by surname, first name, county, and or town. If you have Scottish ancestry, this site might be able to provide you with information regarding your ancestor without costing a small fortune. If you are interested in searching this site, please click here to be directed to the Scotland BDM Exchange website search engine.